I had the lovely opportunity of visiting Stephanie and Megan at Can Do Books in Hawthorn today. If you’re in Melbourne and you’ve not been, you really must go. Their selection of crafty and arty books are totes amazeballs, and the prices are kind of jaw-droppingly reasonable (which is a bit of a rare thing in Australia, actually!). We had a chat about some opportunities to do some really cool stuff together, so I’ll keep y’all posted. In the meantime though, do you mind if I show off the purchase I made while I was there? 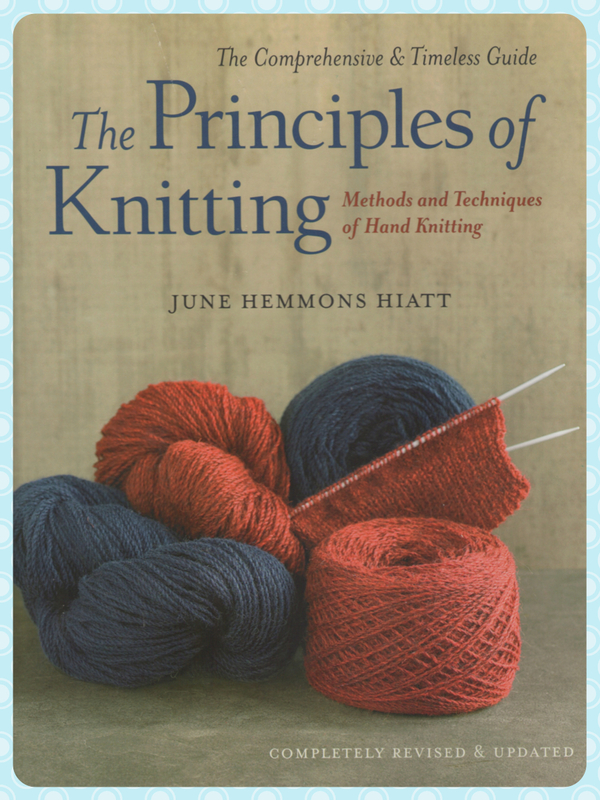 The Principles of Knitting by June Hemmons Hiatt! The 4-1-1 on this book is that it was well popular and then it went out of print for a number of years (the publication details lists it’s last edition as being printed in 1988!). Demand was so high though that people went properly crazy and apparently second hand copies were selling for the $200 ballpark on eBay! Oy! But, it’s been revised and updated and is back on the shelves. Zombie book! It’s alive! I had a quick flip through and was overcome with the desire to take it home with me, so I did, as a matter of fact. I think these will sell like gangbusters, because it’s the kind of book that if you only ever bought one book about knitting, this would do perfectly. Seriously, this thing is so big you could brain someone with it. I tried flipping through some more on the train and I nearly dislocated my arm! And considering it only cost $49.99, let’s be real, I kind of feel like a stole it, just a lil’ bit. I’ll tell you some more about it when I’ve had more time to pour through it (seated safely at the table, mind. No more dislocations). Meanwhile, I have some crochet FOs to show you! 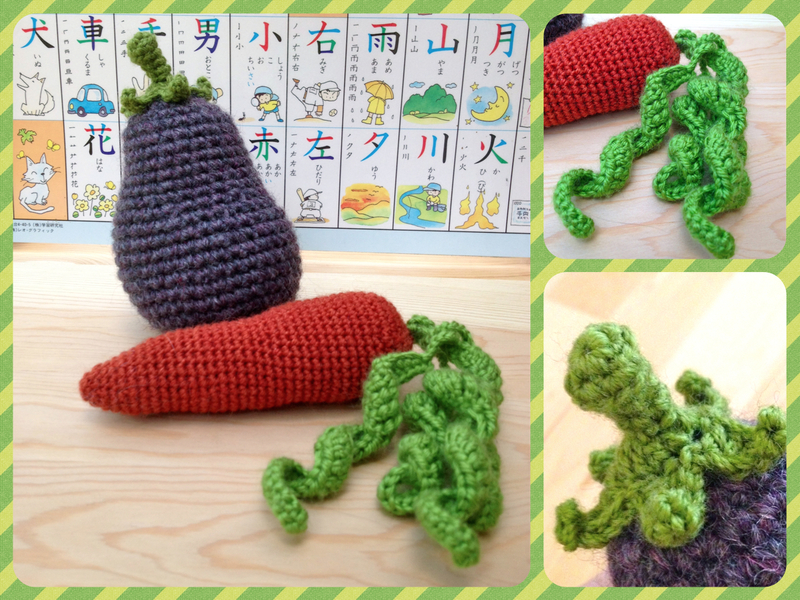 Back when I was at the Loch Quilt and Craft Festival, I was crocheting while I was sitting at my table, and I don’t know what possessed me, but I started to whip up some vegetables, or ‘veggigurumi’ as I like to call them. I did the aubergine first. Now, I would sooner eat my own sick than eat aubergine, but I think they’re pretty and I love their color. And this yarn colorway was even named “Rustic Aubergine” (Morris Estate 14 ply), so I suppose that might have sown the seed for veggigurumi. And the carrot was next because I happened to have a red-orange yarn and I actually do like carrots. So, there you have it! Do carrots and aubergine even go together? I haven't a clue. Anyway, I was really quite happy with how they turned out, actually! I think aubergines are a bit longer, but I wanted it to a be fat little nuggety one. I can’t quite remember what yarn the carrot was made of, but I suspect it was Sean Sheep from Big W (don’t pooh-pooh the Sean Sheep from Big W, it’s actually quite lovely!). The green bits were from some Magnum Soft, which is a pretty decent acrylic yarn if you’re on a budget. It’s quite squishy and not at all scratchy or plastic-y). I feel like I need a few more items for the collection, for a fruit/vegetable bowl or cornucopia if you will. Perhaps an apple or broccoli, I’m not sure. Also, if you missed it, I’ve opened an Etsy store, which you can visit here! And, if you go to this post and comment, I’ll send you a coupon code for 15% off, just ‘cuz I love you. ^_^ Truth be told, you can comment on any post and say you want a coupon code. Ask and ye shall receive. Have you bought some awesome books lately? Share, share, share! Also, Etsy store!! Congrats, guy! I love, love, love the veggies! More please, pears and apples and grapes oh my…. So many loves for you! So many, they can’t be counted. Love the veggies! And that book looks fab. AND that bookshop must be right near my work!! Must go for a look see… I love some of the old classic knitting books. Do you know Maggie Righetti? I love her “Knitting in plain English” which has a brilliant tip for neat edges that I swear by. That Maggie Righetti book is epic, it’s definitely on my shopping list! those veggies are pretty awesome! I want a whole bowl full of them so I can make an arrangement! Oh, that book sounds amazing! I will have to keep an eye out for it. Love your veggigurumi. I would love a little bowl of crochet fruit and veggies for our table!